The Onkyo TX-RZ610 works with the latest 4K TVs and Blu-ray players, delivering multidimensional sound to match the stunning Ultra HD picture quality. We set one up for a Dolby Atmos demo, and there's only one word to describe the sound: big. This receiver filled our spacious training room with powerful, chest-thumping sound. So it's safe to say it'll blow the roof off your home theater — in a good way. The setup was a breeze. Once we ran the AccuEQ speaker calibration (a quick, easy process using the included microphone), all the surround effects sounded perfectly dialed in. Dolby Atmos added an extra layer of realism to our movie demo, giving a feeling of full-on immersion. Built-in Wi-Fi lets you access the music you have stored on your networked computer so you can easily play tracks from your personal library through the 'RZ610. You can also take advantage of free internet radio and subscription-based music services like Spotify® and Pandora®. Use the Onkyo Remote app to control streaming from your phone or tablet. Bluetooth lets you stream music from a compatible device directly to the receiver, and Apple AirPlay lets you stream music from a compatible Apple device or from any computer with iTunes®. Outstanding audio performance is an integral part of the 'RZ610's design. A premium 32-bit/384kHz digital-to-analog converter gives you crystal-clear reproduction of music, TV, and movie soundtracks. Dynamic Audio Amplification delivers massive power with low distortion for thrilling movie sound effects. Phase-matching Bass Enhancement lets you enjoy deep, satisfying low frequency effects while vocals and dialogue remain clear. This receiver also decodes high-resolution audio formats. And Onkyo's Music Optimizer improves the sound from compressed audio files and Bluetooth streams, so you get clear, detailed sound no matter how you listen. The 'RZ610 has outputs for nine speakers, allowing for flexible speaker configurations (receiver can power a maximum of seven channels at once). If you're happy with 5.2-channel surround sound in your living room, you can use the receiver's powered Zone 2 outputs to connect a pair of speakers for stereo sound in another room. Relax to your favorite tunes on the patio while the rest of the family takes in a movie with surround sound in the living room. You can also connect a stereo receiver or amplifier through line-level Zone 2 connections and use the 'RZ610 as a preamp, for full 7.2-channel surround sound in your home theater plus stereo sound in a second room. A second HDMI output lets you watch the same video source in your main zone and a second room. Start a movie in your living room and finish it in your bedroom or kitchen. Or watch the same content on a TV and projector in the same room. Use the Onkyo Remote app to control playback in different zones from anywhere in the house. This unit is great except I'm having issues with the Bluetooth feature. Every time I use Bluetooth feature and disconnect, the unit disconnects from WiFi and i have to reset the unit to get connection back. Not a deal breaker but inconvenient. Everything else is awsome about this unit. Does anyone else have a problem with low subwoofer output? My Def Tech prosub 800 and Studio Monitor 45s sounded much better with my old Pioneer VSX 453...I may have to return this. Yes .... Very low almost non existent! Don't know what to do about it???? RZ Series: Onkyo's premium RZ series AV receivers feature upgraded components, such as a massive transformer and custom capacitors that provide high instantaneous current for lightning-fast transient response and a frequency range that extends down to 5 Hz. Discrete amp circuits prevent phase shifting, clearly focusing the audio image and cutting distortion even at extreme volume levels. The RZ series amplifier delivers a significant boost to the dynamics, detail, and accuracy of music and movie soundtracks for a listening experience that packs a stunning emotional impact. The RZ series are backed by a 3 year parts & labor warranty. Dynamic Audio Amplification: The TX-RZ610 AV receiver features Onkyo's Dynamic Audio Amplification with a 7-channel amplifier rated at 100 watts (into 8-ohms, at 20Hz-20kHz, with 0.08%, driving 2 channels). Onkyo's new Dynamic Audio Amplification technology incorporates a Hi-Current amplifier design w/ discrete output stage circuitry, WRAT (Wide Range Amp Technology), H.C.P.S (High Current Power Supply), separate block construction, and Optimum Gain Volume Circuitry for dynamic, detailed, and clear sound. Hi-Current Amp Design: The unique elements of Onkyo's Dynamic Audio Amplification system comprise high-current, low-impedance architecture with discrete output stage circuitry & custom 15,000 μF audio capacitors for instantaneous high-current power and precisely control of your loudspeakers for dynamic, accurate sound. Wide Range Amp Technology (WRAT): Onkyo's Wide Range Amp Technology (WRAT) circuit layout prevents phase shifting by pushing the roll-off point higher than the listening-level frequency. Amplifying sound without phase shift creates an uncommonly well-focused and realistic audio image. H.C.P.S. (High Current Power Supply): Under the anti-resonant cover of any Onkyo receiver, you'll instantly notice the High Current Power Supply (H.C.P.S.) transformer. With its huge, isolated power supply design and high-capacity filter capacitors, it delivers the large amounts of power necessary for reproducing the wide dynamics of movie soundtracks and the detail and clarity of your music. High-Quality Construction: The AV receiver employs a separate analog amp and digital processing block construction to reduce interference. Copper bus bars and rigid insulators are used to further reduce signal interference. Surround Back (7.1ch): The Onkyo TX-RZ610 provides 7.1ch surround in your main listening area with dedicated Surround Back speakers. 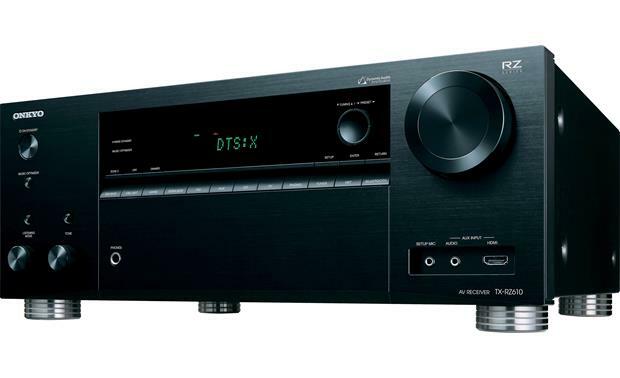 Dual 32-Bit DSP Engines: The Onkyo TX-RZ610 AV receiver employs powerful and highly accurate 32-bit DSP (Digital Signal Processor) engines for better surround sound reproduction. 384kHz/32-Bit Hi-Grade DAC: The Onkyo TX-RZ610 utilizes one premium-quality AK4458 digital-to-analog converter from Asahi Kasei for all channels. This 384kHz/32-bit DAC implements unique low-distortion filtering technologies for clear sound, and unlocks the full potential of any audio format, including compressed, lossless, and hi-res audio (MP3, WMA, WMA Lossless, FLAC, WAV, OggVorbis, AAC, Apple Lossless, DSD 5.6 MHz, LPCM, and Dolby TrueHD). The TX-RZ610 offers additional DAC signal processing to make sure your movie & music soundtracks sound their best. Immersive Surround Sound: The Onkyo TX-RZ610 AV receiver goes beyond regular surround with the latest immersive surround sound formats, including Dolby Atmos, & DTS:X.
Dolby Atmos: With Dolby Atmos, sound comes alive from all directions, including overhead, to fill your home theater with astonishing clarity, power, detail, and depth. The TX-RZ610 has the processing power to run a more enveloping 5.1.2ch Dolby Atmos layout utilizing ceiling mounted or Dolby Atmos-enabled speakers (sold separately). A 5.1.2ch speaker configuration is based upon a traditional 5.1 speaker layout complemented by 2 overhead or Dolby Atmos-enabled speakers. DTS:X (via future firmware update): DTS:X will be enabled through an online firmware update coming later this year. DTS:X is the next generation object-based, multi-dimensional audio technology from DTS. Unbound from channels, DTS:X conveys the fluid movement of sound to create an incredibly rich, realistic and immersive soundscape - in front of, behind, beside and above the audience - more accurately than ever before. DTS:X offers the ability to automatically adapt the audio to the speaker layout that best fits your space. Post Decoding Formats: The Onkyo AV receiver supports Dolby Surround, DTS Neural:X, and DTS Neo:6 (Music/Cinema) to enhance 2-channel and multichannel decoding formats. DTS Neural:X (via future firmware update): DTS Neural:X will be enabled through an online firmware update coming later this year. DTS:X incorporates Neural:X, the latest spatial remapping technology from DTS, which provides a fully immersive output for all types of source content; this includes DTS bitstreams and non-encoded (PCM) data. Neural:X delivers a thrilling sense of immersive sound to your speaker layout regardless of the original source format. Orchestra: For classical or operatic music. Unplugged: For acoustic instruments, vocals, and jazz. Studio-Mix: Suitable for rock or pop. TV Logic: Adds realistic acoustics to TV shows. Game: The receiver offers four different Gaming modes - RPG, Action, Rock, and Sports. All Ch Stereo: Stereo sound from all speakers. Ideal for background music. Theater-Dimensional (T-D): Theater-Dimensional circuitry takes the complexity out of conventional surround-sound setups and lets you experience the excitement of surround sound from as few as two ordinary speakers. Theater-Dimensional's unique multi-speaker modes let you place up to five speakers conveniently by the TV, for the most realistic virtual-surround sound possible. 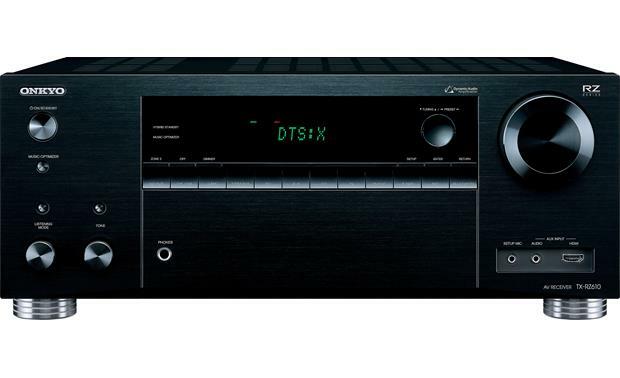 Audio Enhancements: The Onkyo TX-RZ610 receiver provides various audio enhancements to deliver a high-quality listening experience every time. Maximum Volume: Use this feature to set the receiver's maximum volume level. This feature is useful to avoid turning the volume too loud by mistake. You can set the Max Volume from 50-99 (max), or Off (disabled). Front-Panel Aux Input: The TX-RZ610 is fitted with a front-panel 3.5mm Aux input for connecting a portable audio player. Analog Audio Outputs: The Onkyo TX-RZ610 is outfitted with the following analog audio outputs. Binding-Post Speaker Terminals: There are binding-post terminals for all speaker connections - Front, Center, Surround, Surround Back/Height, and Zone 2. The binding post terminals will accept bare-wire, pin-connectors, and banana plugs (single only). Use 6- to 16-ohm speakers. 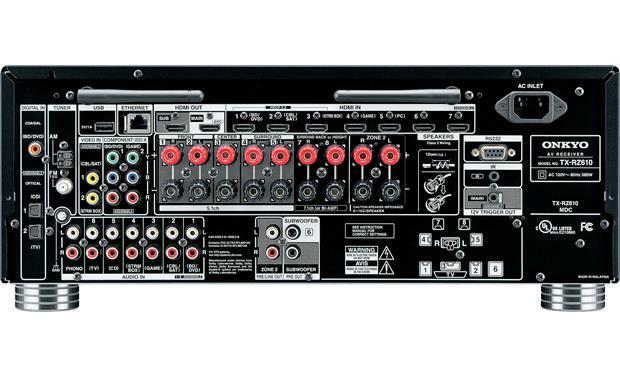 HDMI 2.0a: The Onkyo TX-RZ610 has eight HDMI 2.0a inputs (7 rear/1 front) and dual HDMI 2.0a outputs. The dual HDMI outputs can simultaneously output the same HDMI audio/video signal to two TVs (video is output at the resolution supported by both TVs). Thanks to the latest HDMI 2.0a specification, the receiver can support 4K/60 Hz Ultra-HD video, HDCP 2.2 compatibility, 4:4:4 color sub-sampling, High Dynamic Range (HDR), and BT.2020 Wide Color Gamut. HDCP 2.2: The receivers HDMI 1-3 inputs and both HDMI monitor outputs support HDCP 2.2, which fully complies with the latest copyright protection standard for 4K video transmission. 4:4:4 Color Subsampling: The receiver's HDMI 1-3 inputs and both HDMI monitor outputs support RGB, YCbCr 4:4:4, YCbCr 4:2:2, and YCbCr 4:2:0 color subsampling (@ 60Hz or 50Hz). With 4:4:4 color subsampling, luminance (brightness) and chroma (color) are sampled at the same rate; resulting in an RGB color palette as big as the video sampling rate for a video image with more colors, plus greater color accuracy and detail. HDMI inputs 4-8 only support 4K 60/50Hz @ YCbCr 4:2:0. HDR (High Dynamic Range): HDR provides enhanced picture quality by simultaneously enabling greater detail for both the dark and bright parts of an image. HDR reproduces a greater dynamic range of luminosity or brightness levels, creating greater contrast. This increased contrast reveals the subtle nuances of the image, from detailed blacks and shadows to the brightest whites and colors, plus greater depth. 1080p-to-4K HDMI Upscaling: The Onkyo TX-RZ610 AV receiver can upscale 1080p HDMI video to 4K through its main HDMI monitor output. Other HDMI Features: The TX-RZ610 AV receiver's HDMI connectivity also offers 3D video pass-through, ARC (Audio Return Channel), Deep Color & x.v. Color support, as well as an auto LipSync function. ARC (Audio Return Channel): The receiver's main HDMI output features ARC (Audio Return Channel). This feature allows audio to be sent from your compatible HDTV to your receiver through the same HDMI cable already being used to send audio and video to your HDTV. This eliminates the need for extra cables connected to your television. The sub HDMI monitor output does not support this feature. Analog Video Inputs: The receiver features two composite video inputs and two component video inputs which support 480i video signals only. All analog video input signals are converted to digital and sent via HDMI to your TV at 480i (no upscaling). The component video input are not capable of high-definition video. 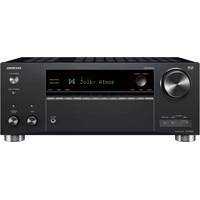 Wired or Wireless Network Connection: The Onkyo TX-RZ610 AV receiver supports a wired Ethernet (RJ-45) or wireless WiFi (802.11 a/b/g/n; 2.4/5GHz) network connection. Via the AV receiver's network connection, you can enjoy music files stored on your computer and listen to internet radio through a variety of online music services. Internet Radio: The Onkyo TX-RZ610lets you access Internet Radio and various online music service providers through its wired or wireless network connection. The TX-RZ610 will display station name and program-related information; such as artist name, song/album title, and elapsed playing time. You can preset up to 40 of your "favorite" Internet radio stations for easy recall. TuneIn With more than 70,000 radio stations and 2 million on-demand programs registered, TuneIn is a service where you can enjoy music, sports and news from all over the world. Pandora Pandora is a free, personalized Internet radio service that plays the music you know and helps you discover music you'll love. You can select Internet radio stations by Artist, Song, or Genre. Spotify Connect If you subscribe to Spotify Premium and have the Spotify App on your Apple iOS or Android smartphone, you can stream Spotify to the Onkyo receiver. Spotify is a digital music service that gives you on-demand access to one of the largest music libraries in the world (over 15 million tracks and counting). Spotify makes it easier than ever to discover, manage, and share music with your friends. You can browse music by artist, album, track, or most popular; and create your own music library with customized playlists. Tidal (Via Future Firmware Update) Tidal is a global streaming service that offers over 30 million songs in high-fidelity CD sound quality. Tidal has two pricing tiers; either $9.99 or $19.99 a month. Both pricing levels allow you to access Tidal's entire music library. The $19.99 tier has the added benefit of high-fidelity sound at CD-level quality. Chromecast Built-in allows you to search, browse, play, skip, and turn up the volume directly from the music apps you know and love on your compatible phone, tablet or laptop. While you cast your music, you can still use your phone to answer a phone call, play a game, send a text, and even leave the room, all without interrupting what's playing on the receiver's speaker system. Friends and family can even use their own Chromecast Built-in compatible phone or tablet to cast music to you system by connecting to your home's WiFi network. Built-in Bluetooth: The Onkyo TX-RZ610 features built-in Bluetooth (version 4.1+LE) with support for profiles A2DP 1.2 and AVRCP 1.3. You'll be able to wirelessly stream stored music and music apps from your Bluetooth-enabled Apple iPod/iPhone/iPad, Android smartphone/tablet, Windows Phone/PC, & Mac laptop/computer, as well as other Bluetooth compatible devices to the Onkyo receiver. SBC + AAC Codecs: In addition to support for the standard SBC Bluetooth audio codec, the TX-RZ610 offers support of AAC. By supporting AAC, the receiver offers better audio performance of the music streamed from your Apple iPod, iPhone, or iPad. Zone 2: In addition to the main listening room, you can also enjoy audio playback from a different source in another room of your home using the receiver's Zone 2 function. The receiver features Zone 2 line-outputs, as well as Zone 2 speaker terminals. By using the line-level outputs on the TX-RZ610 you can connect an external receiver or integrated amplifier in a second room, allowing you to listen to 7.1ch surround in the main room and play a different audio source in another room of your home. By using the speaker-level outputs on the TX-RZ610, you can directly connect a secondary pair of speakers in another room of your home, allowing you to listen to 5.1ch surround sound in your main room and play a different audio source in the other room. The volume of Zone 2 is controlled from the receiver when using the speaker outputs and from your add-on integrated amp when using the line-level outputs. Compatible Zone Sources: Tuner, Analog, Optical/Coax Digital (2ch PCM only), USB, Network (not DSD), and Bluetooth audio sources can be sent to Zone 2. Incompatible Zone Sources: HDMI audio/video and analog video sources cannot be output to Zone 2. Dual HDMI Outputs: The AV receiver's dual HDMI outputs can simultaneously output the same HDMI audio/video signal to two TVs (video is output at the resolution supported by both TVs). FireConnect MultiRoom Audio: A future firmware update will enable any audio source connected to the receiver (from vinyl to streaming audio) to be sent wirelessly via FireConnect, Powered by Blackfire, over a WiFi connection to an optional Onkyo wireless speaker (scheduled for release in summer 2016) placed anywhere in your home. Stable, fast, and easy to control with a mobile app on your smartphone. Note: Onkyo cannot guarantee the compatibility of its AV receivers with other devices featuring FireConnect. 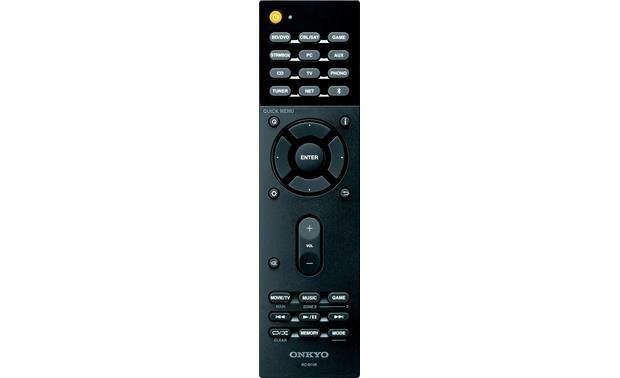 Onkyo Remote App (for Apple iOS & Android): The Onkyo Remote App (from Apple's App Store & Google Play) allows you to operate the Onkyo AV receiver from your Apple iOS (4.3+) or Android (2.1+) device, using your home's wireless network. The Onkyo Remote App lets you access Internet Radio stations, AM/FM stations, DLNA content, and Input sources right from your mobile device. Content information will be displayed on the device's touchscreen. You also get to adjust tone controls, listening modes, and speaker volume from your compatible Apple iOS or Android device. The Onkyo Remote App even allows you to wirelessly stream audio stored on your Apple iOS or Android device to the Onkyo AV receiver and lets you control audio output for up to two Zones. The Onkyo AV receiver and your compatible Apple iOS or Android device must be connected to the same home network. HDMI Control: This function allows HDMI-CEC compatible components or RIHD-compatible components connected via HDMI to be controlled with the TX-RZ610 . The AV receiver offers the following HDMI-CEC controls. Remote Connection: The TX-RZ610 contains a IR input, 12V trigger output, and a RS-232C port for custom remote integration. IR Input: The 3.5mm IR input jack allows you to control the receiver without line-of-sight access using an optional IR remote control system and locating the remote sensor in sight. 12V Trigger Out: The 12V trigger output (3.5mm) can be connected to the 12-volt trigger input on a power amplifier in Zone 2 for remote turn-on. RS-232C Port: The TX-RZ610 has an RS-232C port for connection to external control systems from companies, such as AMX or Crestron. In a 5.1 set up: Can the last two channels be used to bi-amp the REAR LR speakers? Not the rear pair, no. The additional channels can be used to bi-amp the primary front left & right channels though. Can I use a Yamaha MusicCast WX-010 with this receiver? can it play blue tooth wireless headphones? Having owned this receiver for three weeks now and planning on making wireless headphones my next purchase I have to agree with richard s, the BT only works for a source, not for output. I'm thinking of returning and after reviewing several manuals of competing units it appears that at this price point the same is true for Denon. However, Yamaha and Sony do offer BT output. It's nice that Crutchfield offers the manuals - Be sure to read carefully before buy. I wish I had. Other than this issue - I love everything else about the TX-RZ610. In a 5.1 setup can I use the last two channels to bi-amp my front L/R speakers? Do the Zone 2 speakers play the same music as the surround speakers? 95% sure zone 2 plays the same as surround. Playing seperately that is newer technology. After speaking with Crutchfield customer and technical support, I turned up the sub output in the speaker settings. This increased the sub output, but no by much. After checking all of the settings, I tried turning off the AccuEQ and that did the trick! What a difference this made. Maybe more small room size had an adverse effect when I set things up, I don't know. This receiver sounds excellent now! I originally had my Prosub 1000 connected to this, then later my SVS SB13 Ultra. I haven't had any issues with subwoofer output. I had a Dennon before the Onkyo and have not noticed any lower output since swapping receivers. The outputs to the subwoofer and to zone 2 are very low. I had to increase the sub plus 10db using the controller app. I have not found a good solution for increasing the signal on zone 2. I am using a Yamaha sub-woofer and am able to get good out put by adjusting both the specific volume through the receiver and adjusting the volume control on the sub-woofer itself. 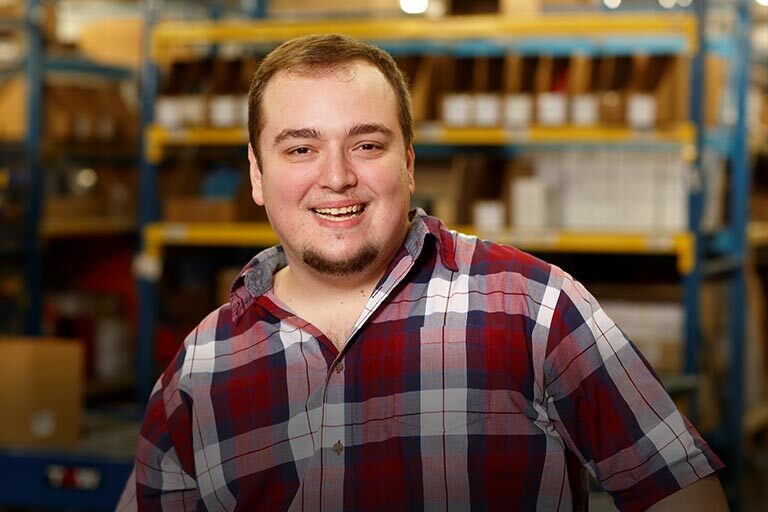 Can the USB drive be used as a drive from a computer once connected to my home network? I'd like to insert a USB drive on the rear panel then transfer media to the drive from my PC for audio playback. No. Unfortunately, the USB drive isn't exposed as an accessible drive on a network. When connected to my home network, can an attached USB drive be used to transfer music to from a computer on the home network? A rear panel USB port/drive will be difficult for me to access. Will the USB drive act as a new drive on my networked PC? James H is correct. Unfortunately, the USB drive isn't exposed as an accessible drive on a network. Another option would be to get a USB extender cable so you don't have to access the rear panel with every USB drive change. I don't believe that will work, at least it doesn't for me. An alternative is to load music server software on your computer and use the receiver's network capability to access music files. I use Asset UPnP, which is free. Can you airplay to Zone 2 from iPad? Unknown. I don't have an IPad. "WTIDAL and Google Cast functionality available via future firmware update" What does that mean? That it currently will not accept Google Chrome devices? The previous 4/25/2017 firmware update (Version 2059-0030-4040-0008), added support for Chromecast. The latest firmware version is: 8/31/2017 2079-2040-5050-0008 and can be downloaded from Onkyo. The update has been loaded. It does accept google chrome devices. Can this receiver decode DVD-A and SACD via HDMI from an appropriate player? i like home theater and i have a good system. Movies are one thing. But i want a receiver that will reproduce music as it's recorded. I don't want to amplify anything, reproduce anything, tweak settings, etc. I want to hear a violin in the orchestra pit, i want to hear a guitar straight as recorded, i want to hear depth. Not just volume. Can this receiver do that? can the usb port play back video from a camcorder or photos? There is not an usb port on the front of this unit. The Onkyo TX-RZ610's USB port allows you to enjoy a variety of audio files from a USB storage device. However, I'm afraid it doesn't support video and/or photo playback via the USB input. For more details or to discuss further, please feel free to contact an Advisor directly by phone (888.955.6000) or online chat. Does this receiver allow for front 'wide' or 'width' speakers? Does this receiver have Audyssey dynamic eq and dynamic volume, or something similar? There is an "AccuEQ Room Calibration" procedure using a supplied speaker setup microphone. This is described on page 18 in the manual. Worked for me! The set up menu contains a "Dolby Loudness Management" and a Late Night volume control. It has the self programming eq where you hook a microphone up and put it at the center listening postion. Receiver then plays test tones and forms equalizer settings. They can be used for all speakers, center only, or completely turned off. It also has preset equalizer that you can adjust manually. is this receiver able to be racked without modification? If by racked you mean sliding it into an open slot in your stereo cabinet, yes. It doesn't have mounting holes if your cabinet requires them. I slid it into the old receiver slot in my cabinet and it worked fine. You do have to allow for the two 802.11 wireless antennas on the back if you need better reception. Can this receiver play audio from an hdmi input in the zone 2? Sorry, no. You can view the "Compatible" and "Incompatible" Zone 2 sources by clicking on the "Details" tab on the receiver's main webpage and scrolling down below the "Features & Specs" table. Can't this receiver actually do 5.2.2 Atmos?